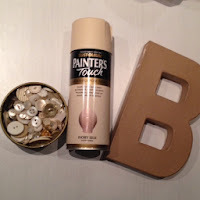 Whilst browsing on pinterest I found some lovely button initials but at quite a heafty price, I really fancied one for our 'family' wall on the stairs so thought I'd have a go at creating my own. 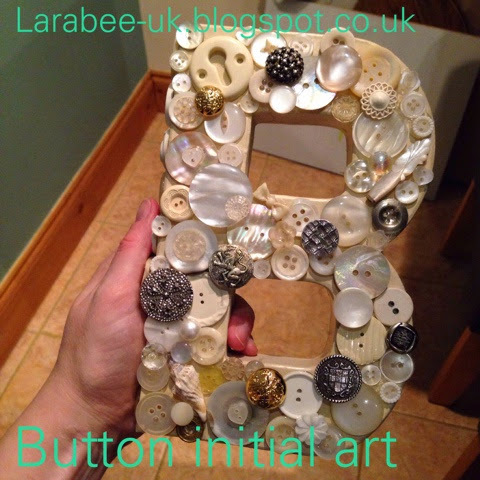 A few months ago my Grandma gave me her button box as I used to play with it all the time as a child and it hold great memories for me, I knew that I wanted to use buttons from her box to make my initial art. 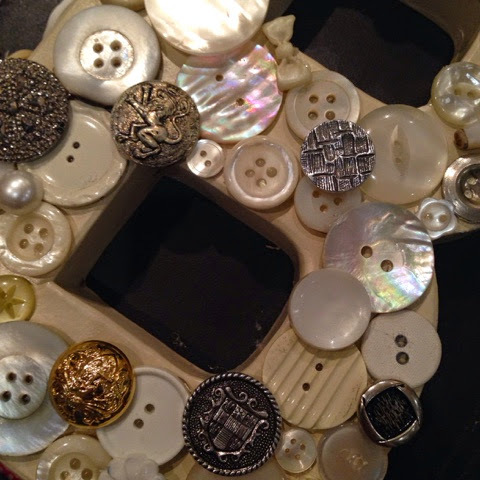 First I sorted all the buttons I wanted to use, I stuck to mother of pearl, white, cream and clear with a few metal ones thrown in. 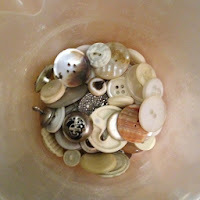 There were a couple from my button box to use as fillers. At this point I wasn't sure if I had enough, but T and I filled a tin and I hoped for the best. 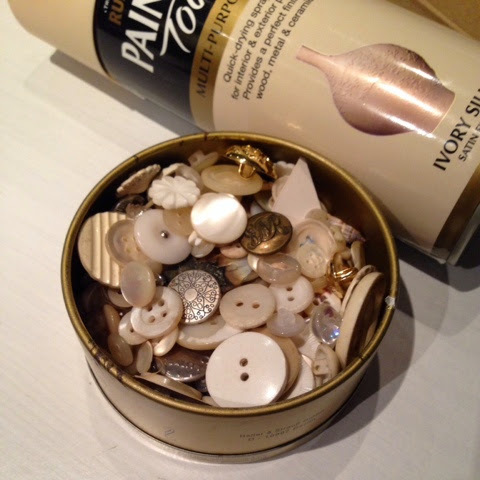 I also added a couple of bits which I knew had been in a grandmas tin for a long time, like the keyhole, the mother of pearl handle from a nail file and an old shell. Using the can of painters touch I used for my button frame last year, I sprayed the paper mâché initial. 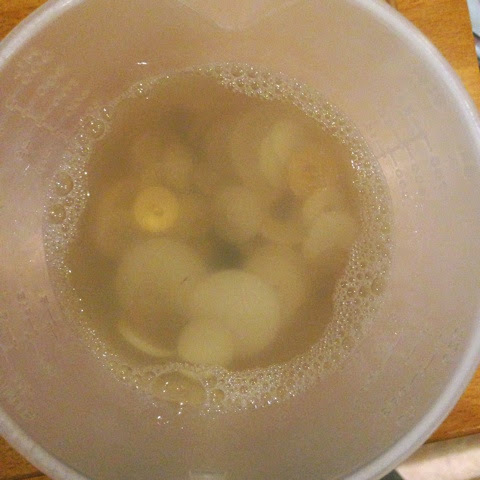 I washed the buttons with washing up liquid, giving the a good soak and them scrubbing them with an old toothbrush. 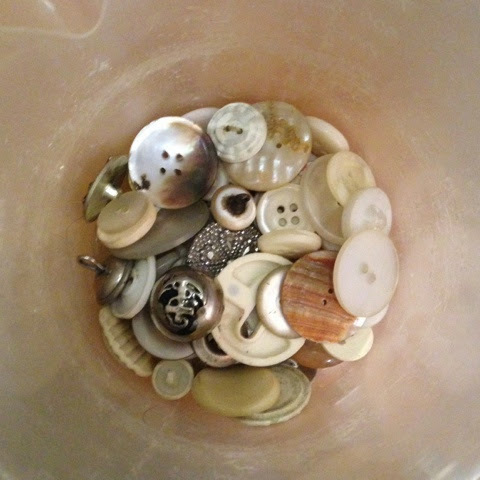 Although the buttons didn't look particularly dirty, they were filthy! I'm really glad I didn't skip this part! Once dry, I used the hot glue gun to attach the buttons, at first I tried to place the buttons in position before gluing but I soon realised that it was unnecessary and I actually preferred to just go a bit more random, there are a couple of areas which could have done with different positioning but in general I'm pleased. I didn't bother removing the button shanks, instead I just built up buttons underneath ans then used the buttons with a shank to fill the spaces. There were still a few spaces left so I filled those with tiny buttons or miniature shells. I remember button boxes with great fondness. 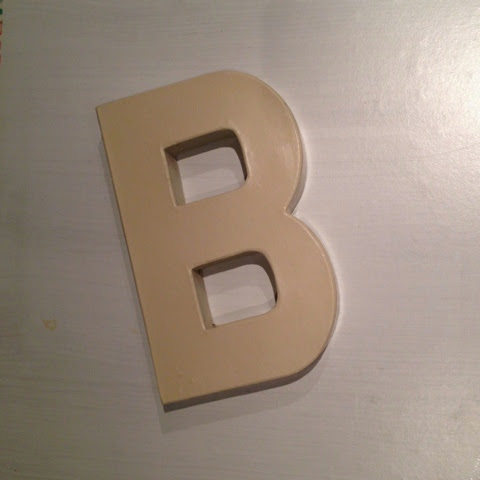 I loved it when they were in refurbished cookie tins. Now I have only a couple of buttons. What happened to those button tins? Displaying them as you have is a great way to keep seeing them. My grandmas box is a big old chocolate tin and mine is the modern equivalent, my son loves to rifle through just as we did when'd we were small. That looks great! I have a bunch of old buttons and this is a craft I could actually do! Thanks. Thanks so much, it really was simple. I love it! 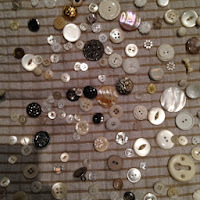 Wish I still had my grandmother's old buttons. She died age 97 in 2010. This is an excellent idea.